Eric is the Discworld's only demonology hacker. The trouble is, he's not very good at it. All he wants is the usual three wishes: to be immortal, rule the world and have the most beautiful woman fall madly in love with him. The usual stuff. But what he gets is Rincewind, the Disc's most incompetent wizard, and Rincewind's Luggage (the world's most dangerous travel accessory) into the bargain. 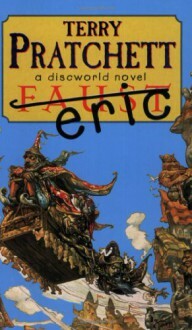 Terry Pratchett's hilarious take on the Faust legend stars many of the Discworld's most popular characters in an outrageous adventure that will leave Eric wishing once more - this time, quite fervently, that he'd never been born . Another hilarious entry in Discworld by one of the masters of satire. Rincewind finds himself accidentally traveling through time and visits a rather humorous version of Hell. Again, I found myself laughing out loud while reading this. Didn't get far. DNF. See update. If it sets any fans at ease, reading "Mort", despite occasional but real flashes of brilliance, isn't compelling to me either.